MILTON, Del. 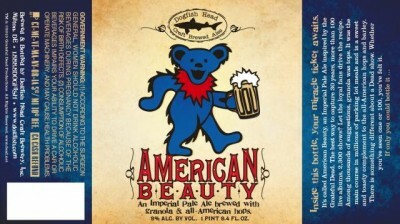 — American Beauty, the counterculture collaboration between Dogfish Head Craft Brewery and the Grateful Dead, will be hitting taps and shelves over the next few weeks. American Beauty will be available on draft and in 750-ml bottles throughout Dogfish Head’s 27-state distribution network, in accordance with local laws. To find retailers who have received shipments in the past 60 days, try Dogfish Head’s “Fish Finder” app at www.dogfish.com.